Golisano Institute for Sustainability (GIS) at Rochester Institute of Technology wanted a “signature building” that would serve as a living laboratory for scientific discovery and experimental learning, a place where students could focus on developing and introducing sustainable technologies for manufacturing, transportation, energy production and construction that could serve as the western gateway to RIT. 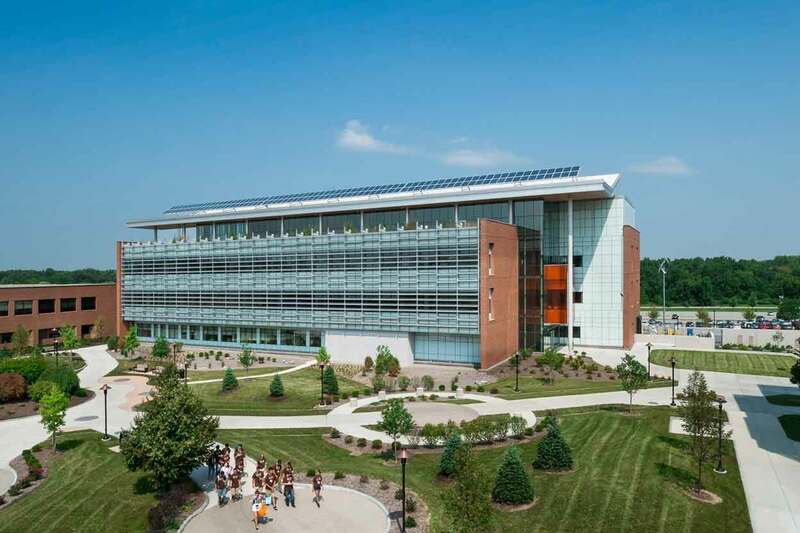 Under a design-build contract, SWBR, FXFOWLE and LeChase Construction partnered to design and build the new 84,000 SF, four-story Golisano Institute for Sustainability research building. The facility contains integration laboratories and eight support laboratories, as well as spaces for collaboration and computing to support programs such as eco-IT, sustainable products and production systems, sustainable energy, sustainable mobility and system sustainability. Golisano Institute for Sustainability is among the first in the world to offer a Ph.D. program in sustainability. The building itself is LEED Platinum® and is a demonstration of sustainable technology, incorporating transparent infrastructure, a smart microgrid, and a computing data center so visitors can see firsthand the use of sustainable building technologies and energy systems. This project was recognized in 2013 by the Engineering News Record New York for the region’s best project in the Green Project category and has also received the Design-Build Institute of America (DBIA) National Award of Excellence for Education and the DBIA Award of Excellence in Design. Click on the hot spots below to learn more about the sustainable features of this building. Provides insulation value and absorbs runoff from rain and snow, as well as provides public greenspace. In the lobby of the building, a 45-foot-tall living green wall contributes to the air quality of the building. Three wind turbines generate electricity for the building. A sunshade system of louvers reduces the heat load from direct sun exposure, allowing daylight to enter the building in the most efficient way. Eight geothermal wells supplement the conditioning of the building. Golisano Institute for Sustainability is one of the greenest buildings in the world. The features inside the building are made of sustainable materials and the project team took great care to reduce construction waste and maximize energy savings. An external 400 KW Fuel Cell that produces enough energy to power the building, essentially allowing the building to go “off the grid,” making the building self-sufficient. Rainwater collection system that is distributed throughout the building for non-potable water use. Microgrid room, which takes the power that’s generated from various sources, stores the energy and distributes it as needed. Systems Performance and Realiability Lab houses a 300HP transmission dynamometer that can test motors, alternators, and generators. Sustainable Building Materials Lab, where students research countless building products and materials that make up, shape, impact, and determine the physical/built environment. Staples Sustainable Innovation Lab, is a research hub to assist in the development of sustainable office products and business practices worldwide. Eco-Design Lab, where researchers study more-efficient ways to operate server rooms. Equipment in this lab allows the customer to use any combination of traditional air conditioning, outside air and air flow management within the room to keep equipment cool while using less energy. For more information about the Golisano Institute of Sustainability Research Building, click here.